You do not need me to tell you this, but the SNES Classic is absolutely radical. If you want one, you should get it. If you think you want one, you should get it. If you’re on the fence, you should get off it. 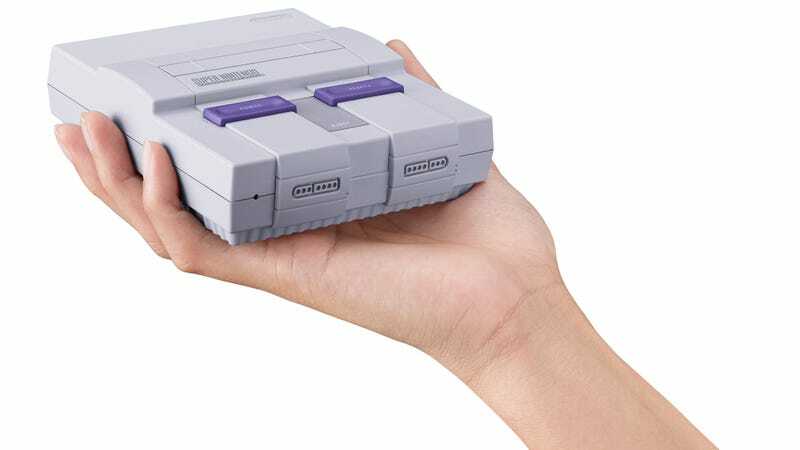 After playing with the system for a few days, I can offer a host of tiny qualms—the cords are again far too short; they connect via an awkward flip-down panel; you can only exit a game by hitting the reset button on the physical console; it’s probably going to be sold out everywhere. But at the end of the day, there are at least a dozen or so all-time great games here, along with a bunch of strong contenders and time-capsule picks (21 in total). It’s only fitting that it all comes packaged in a little plastic box that is that rarest of things: A video game console that unabashedly looks like a video game console while also being almost unctuously adorable. Game collections like this come around every now and then, and the response is always something like this. Most recently was Rare Replay, released in 2015, which collected 30 games from throughout the storied developer’s history. I remember downloading it at the time with high hopes for studiously completing Conker’s Bad Fur Day, toying around with the wonky Viva Piñata, or sinking a day or two into the wonderfully ugly cult favorite Kameo. And yet, a few years later, I’ve only ever powered a few of those up; I couldn’t even suffer through the tutorial of Banjo-Kazooie, ostensibly the reason I bought the thing in the first place. I’ve also assembled a few retro collections manually for myself over the years, on Virtual Console or via Steam Sales, many of which also only netted peremptory college tries. Retro gaming is a lot more fun in theory than it is in practice. This is perhaps the most difficult medium to do your homework on, punishing you for your ignorance with an impunity that’d at least be intentional today. The difference between all of these experiences and the SNES Classic is, of course, Nintendo. While it didn’t develop all of these games in-house, many of the system’s flagship titles—Super Mario World, Zelda: A Link To The Past, Super Metroid, and so on—were, and they sparkle with that same canny aesthetic embrace of a platform’s technical limitations and the company’s century-long obsession with pure, self-manifesting “fun” that continues to make Nintendo’s games pioneering. This was all in evidence on the games collected on the NES Classic, but on the SNES, the company’s artists took a quantum leap forward in playability, fairness, and invention. In part, many of these games represent the pinnacle of their genres, before they were forced to grapple with the third dimension. But they also hit highs that later “retro” titles couldn’t quite reach. The surplus of 2-D Metroid games of the past few decades have never again reached the eerie world-building of Super Metroid; the New Super Mario Bros. throwback games threw bells and whistles onto a form that had been polished to perfection on the two titles included here. Outside of those, there are a handful of all-time great platformers here—Donkey Kong Country, Super Ghouls ’N Ghosts, Mega Man X, Super Castlevania IV—but the package’s real enduring bounty, at least as far as I’m concerned, is its inclusion of four classic Japanese role-playing games, a genre of uncommon richness and resilience. Mechanically, little has changed between these games and something like the mega-budget Dragon Quest XI or Ni No Kuni II slated to be released in the next year or so. But these are games that, in the case of Final Fantasy III and Secret Of Mana, set the mold that has proven so enduring, or in the case of Super Mario RPG, functioned as a one-off extravagance never to be repeated again. (Do not talk to me about those interminable Mario & Luigi or Paper Mario games.) And Earthbound’s influence resounds to this day, its outsider vision of American pop culture mixed with surrealist, almost Lovecraftian horrors proving impossible to replicate. And so, while there are a lot of other good bang-for-your-buck ways to collect and play a bunch of classic games, none of them are quite so full of that rare variety of classic game that remains as compulsively playable today as it was upon its original release. (I hesitate to say this, but a Nintendo 64 Classic might find games once again in a formative state, often looking and feeling worse than we’d like to admit after years of iteration but not reinvention.) So high was I on the generousness of the SNES Classic that I even fired up Kirby Super Star to see if my off-handed dismissal of it was too harsh, and I will admit I found in it yet another trove of feverish imagination, a nightmare of pastel mutations and Day-Glo menace. It contains within its multitudes a test of strength mini-game, a dungeon-crawler, the ability to eat things and become them, and twilit samurai duels against other sentient food-like things. The game is, like so much else on the SNES Classic, a celebration of the creativity that thrives in limitation and of that strange fertile era when Japanese games were bursting with it.